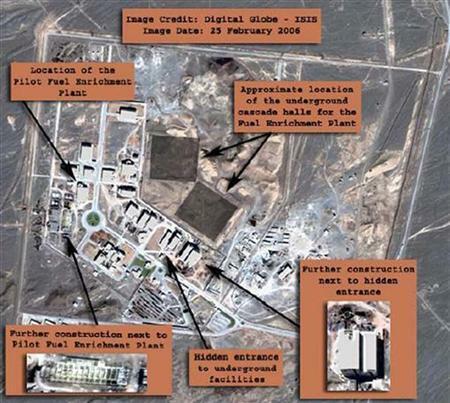 A view of the underground uranium enrichment plant at Natanz, Iran, in a DigitalGlobe satellite image released with notations by the Institute for Science and International Security (ISIS) on April 16, 2006. VIENNA (Reuters) – U.N. inspectors found “nothing to be worried about” in a first look at a previously secret uranium enrichment site in Iran last month, the International Atomic Energy chief said in remarks published Thursday. Mohamed ElBaradei also told the New York Times that he was examining possible compromises to unblock a draft nuclear cooperation deal between Iran and three major powers that has foundered over Iranian objections. The nuclear site, which Iran revealed in September three years after diplomats said Western spies first detected it, added to Western fears of covert Iranian efforts to develop atom bombs. Iran says it is enriching uranium only for electricity. “The idea was to use it as a bunker under the mountain to protect things,” ElBaradei, alluding to Tehran’s references to the site as a fallback for its nuclear program in case its larger Natanz enrichment plant were bombed by a foe like Israel. “It’s a hole in a mountain,” he said. The IAEA has declined to comment on whether the inspectors came across anything surprising or were able to obtain all the documentation and on-site access they had wanted at the remote spot about 160 km (100 miles) south of Tehran. Details are expected to be included in the next IAEA report on Iran’s disputed nuclear activity due in mid-November. The inspectors’ goal was to compare engineering designs to be provided by Iran with the actual look of the facility, interview scientists and other employees, and take soil samples to check for any traces of activity oriented to making bombs. Western diplomats and analysts say the site’s capacity appears too small to fuel a nuclear power station but enough to yield fissile material for one or two nuclear warheads a year. The Islamic Republic revealed the plant’s existence to the Vienna-based U.N. nuclear watchdog on September 21. It said the site, which remains under construction, would enrich uranium only to the low 5 percent purity suitable for power plant fuel. Enrichment to the 90 percent threshold provides the fissile material that detonates nuclear weapons. After talks with Iran and three world powers, ElBaradei drafted a plan for Iran to transfer most of its low-enriched uranium (LEU) to Russia and France to turn it into fuel for a Tehran reactor that makes isotopes for cancer treatment. Russia, France and the United States, which would help modernize the reactor’s safety equipment and instrumentation under the deal, see it as a way to reduce Iran’s LEU stockpile below the threshold needed to produce material for a bomb. But since the October 19-21 talks, Iran has made clear it is loath to ship its own LEU abroad because of its strategic value, and would prefer buying the reactor fuel it needs from foreign suppliers. Iran has called for more talks. Western diplomats say the three powers do not want more talks and that Iran’s demands are a non-starter as they would do nothing to remove the risk of nuclear proliferation in Iran. “The issue is timing, whether the uranium goes out and then some time later they get the fuel, as we agreed (tentatively) in Geneva, or whether it only goes at the same time as the fuel is delivered,” he said.